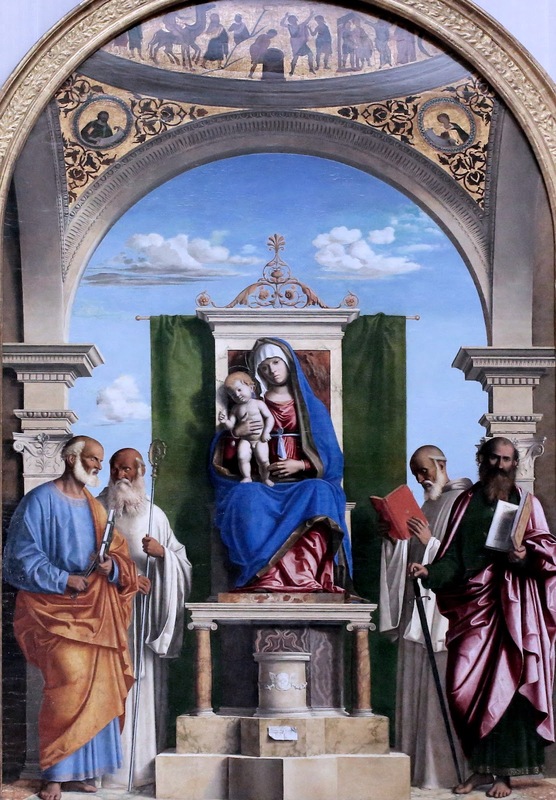 Giovanni Battista Cima, also called Cima da Conegliano (c. 1459 - c. 1517), was an Italian** Renaissance painter, who mostly worked in Venice. 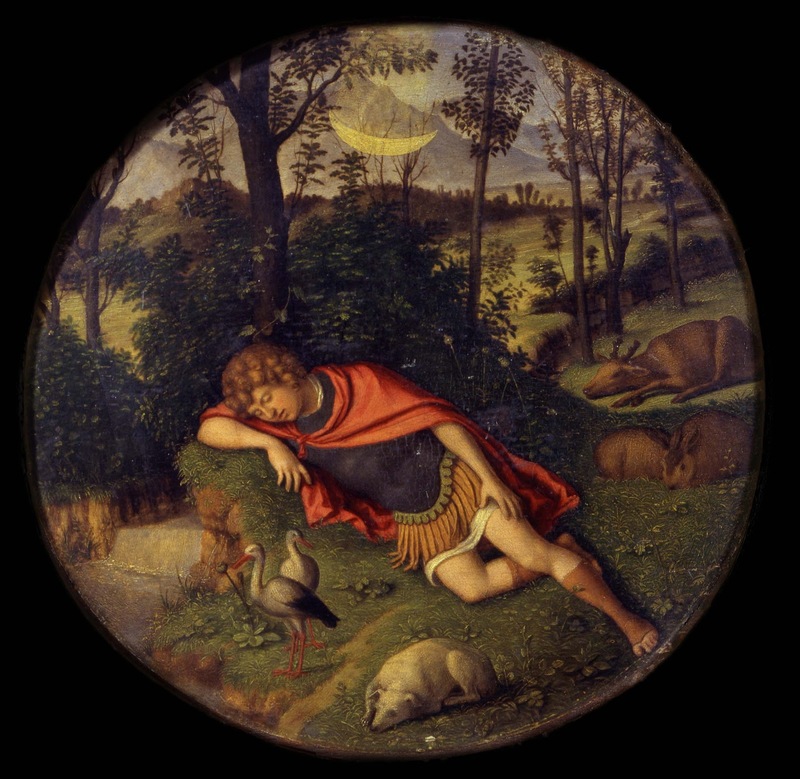 He can be considered part of the Venetian school, though he was also influenced by Antonello da Messina, in the emphasis he gives to landscape backgrounds and the tranquil atmosphere of his works. 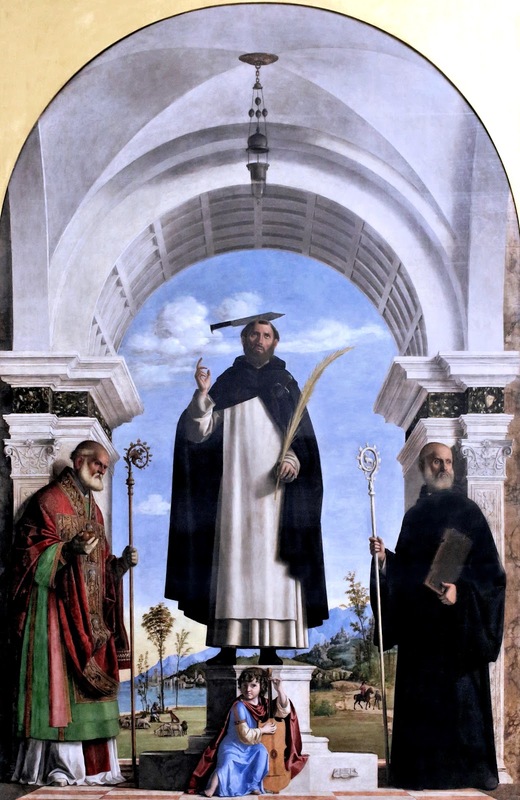 Once formed his style did not change greatly. 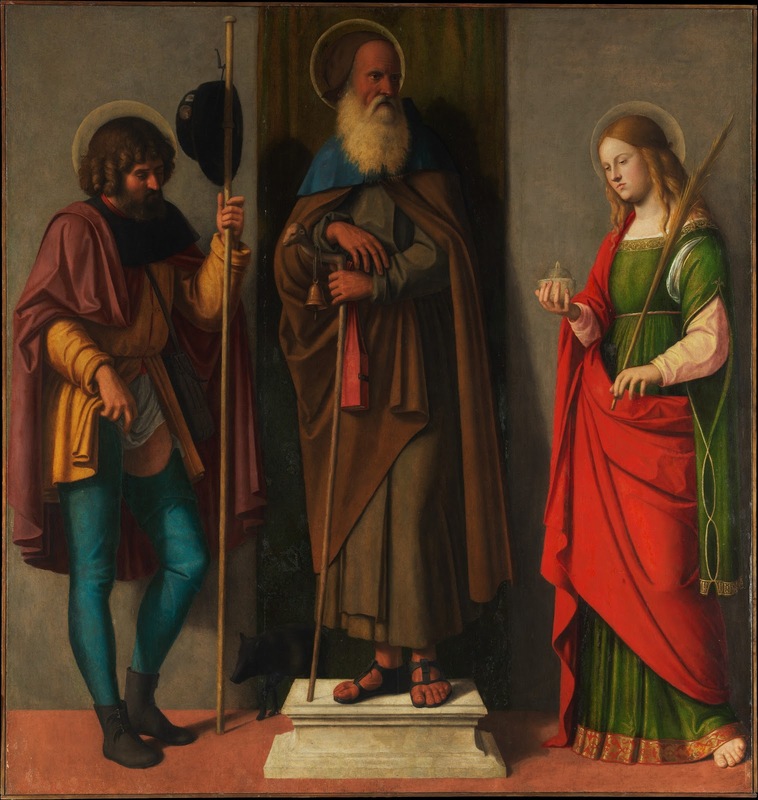 He mostly painted religious subjects, often on a small scale for homes rather than churches, but also a few, mostly small, mythological ones. 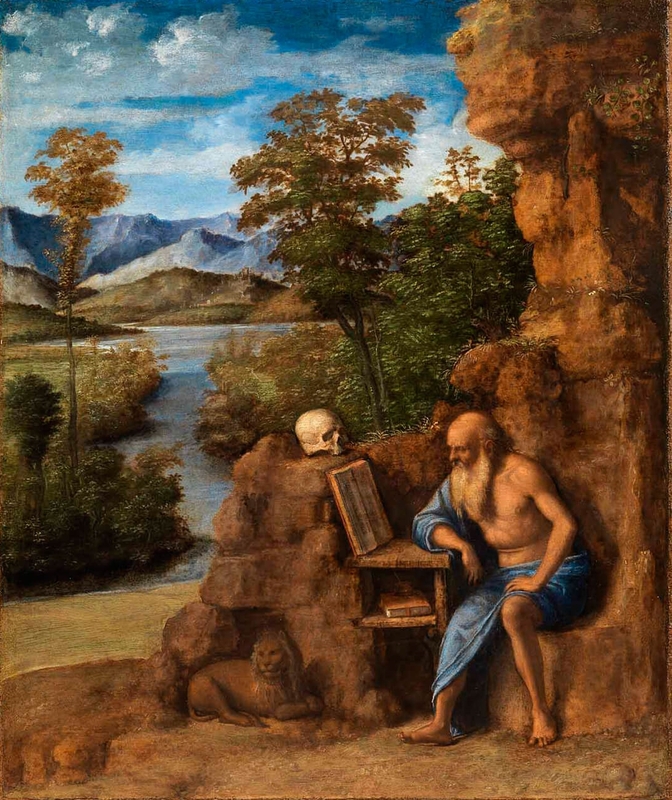 He often repeated popular subjects in different versions with slight variations, including his Madonnas and Saint Jerome in a Landscape. 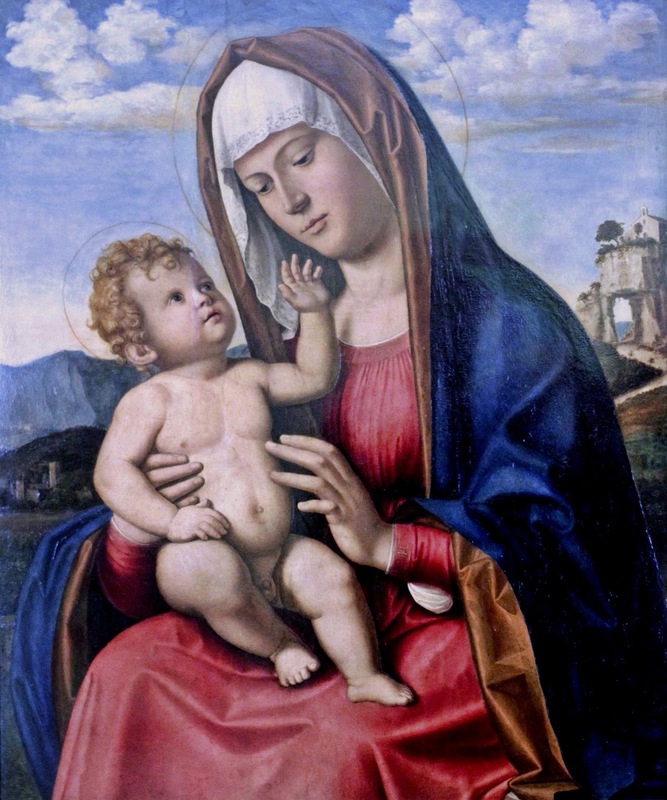 His paintings of the Madonna and Child include several variations of a composition that have a standing infant Jesus, which in turn are repeated several times. Giovanni Battista Cima was born at Conegliano, now part of the province of Treviso, in 1459 or 1460. 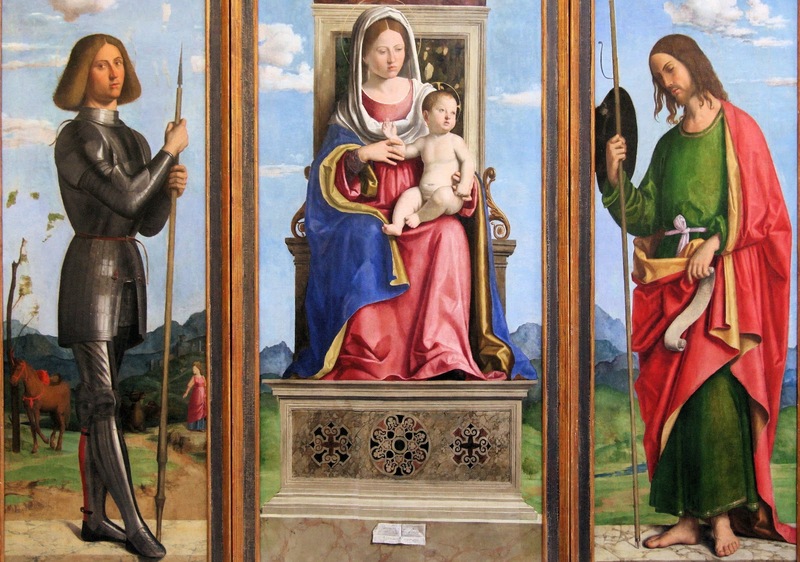 His father, who died in 1484, was a cloth-shearer (cimator), hence the family surname. 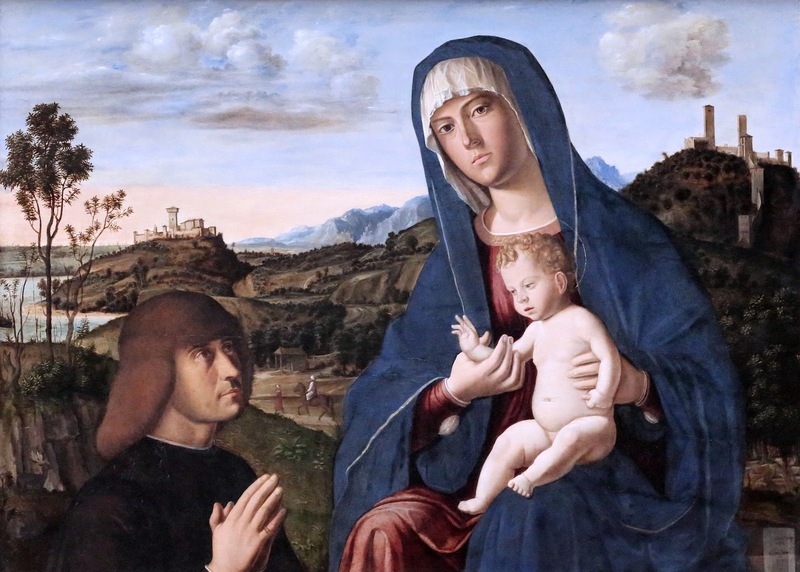 In 1488 the young painter was at work at Vicenza; in 1492 he established himself at Venice, but by the summer of 1516 he had returned to his native place. 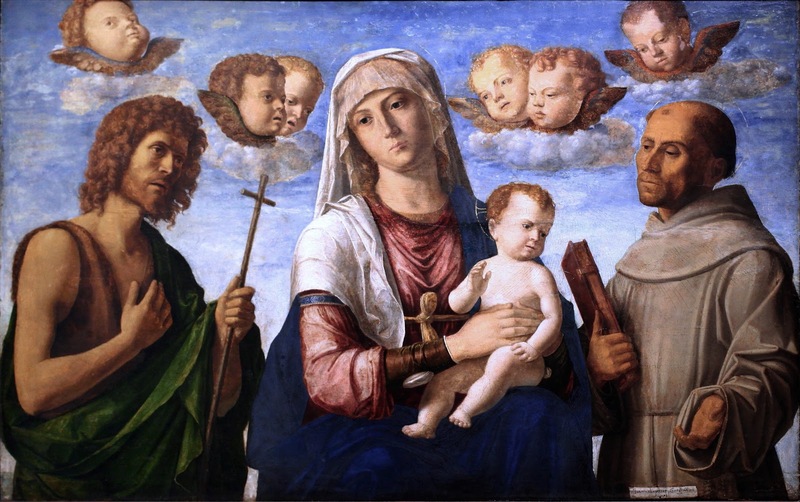 Cima married twice, his first wife, Corona, bore him two sons, the older of whom took Holy orders at Padua. 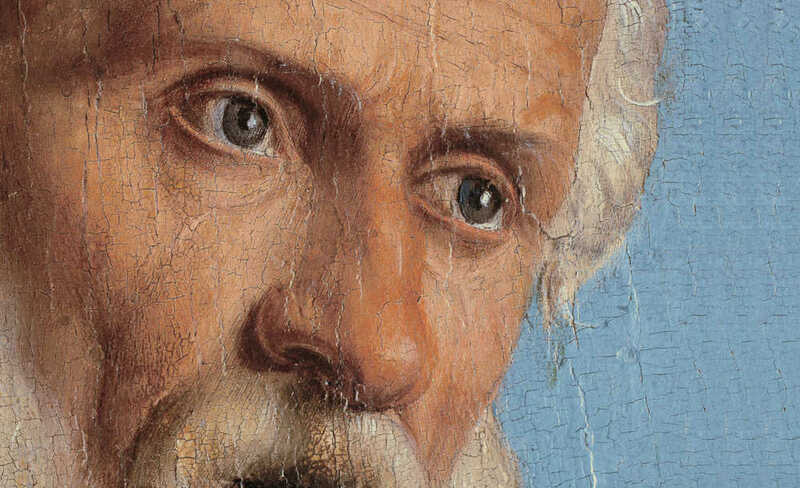 By Joanna, his second wife, he had six children, three being daughters. 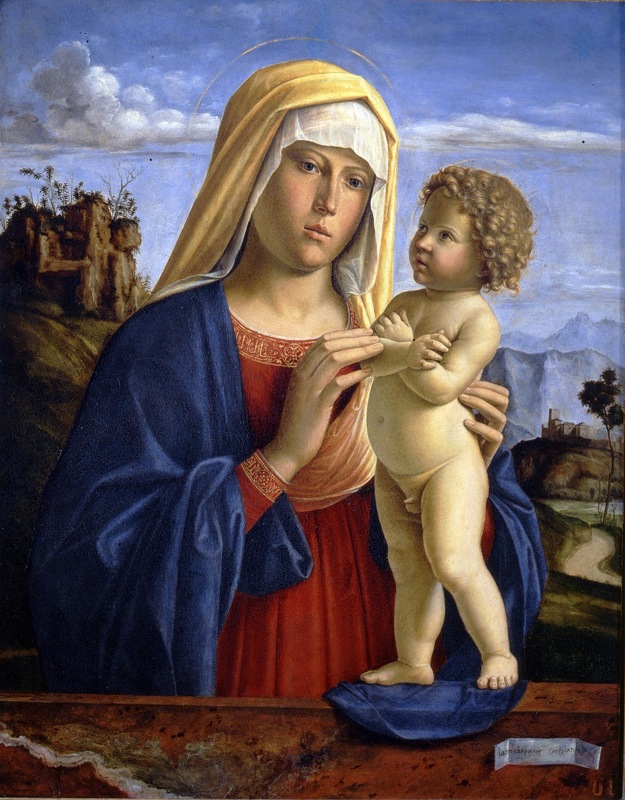 His oldest painting inscribed with a date is the Madonna of the Arbour (1489; now in Museum of Vicenza). 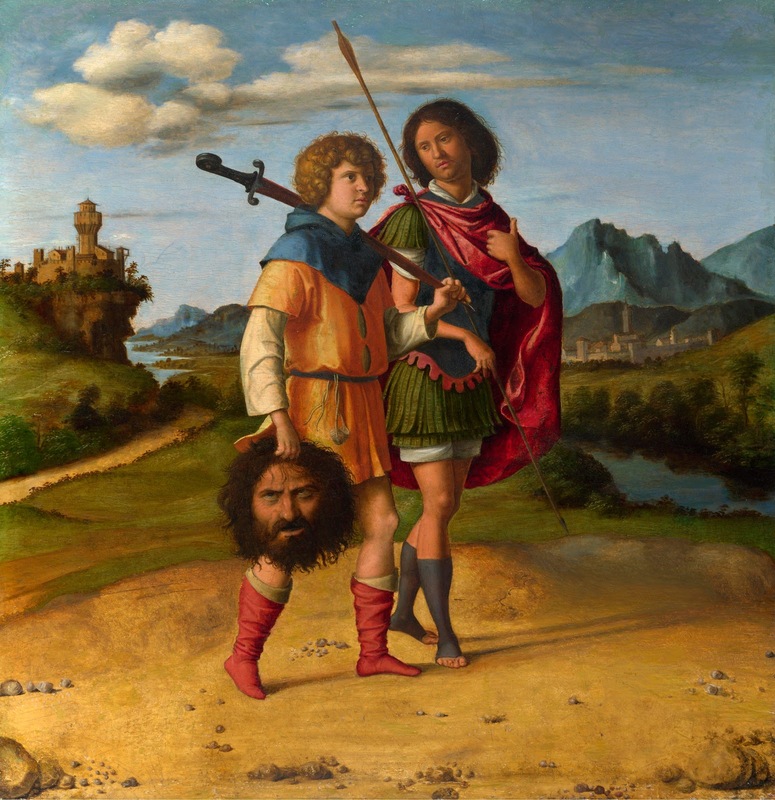 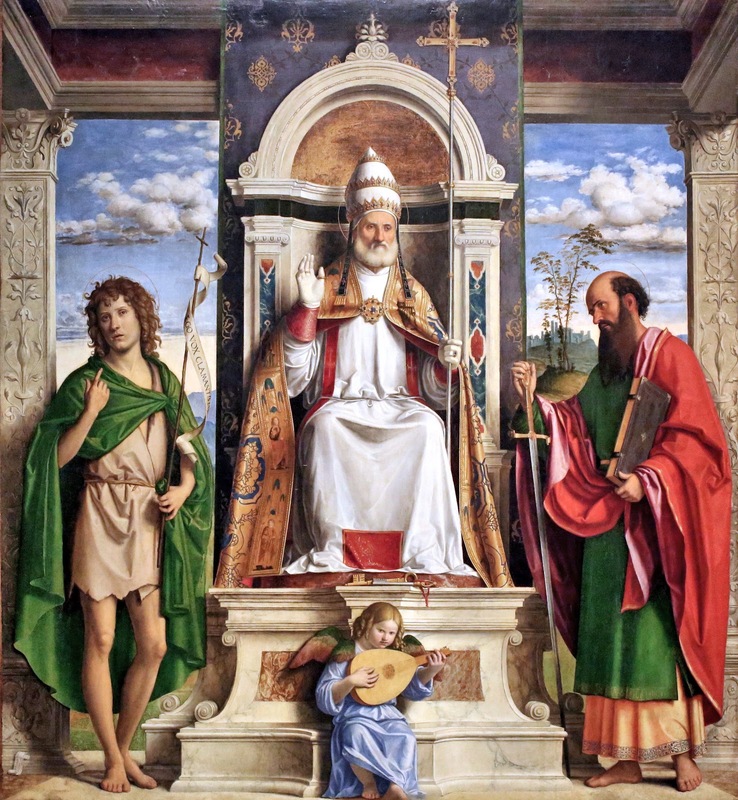 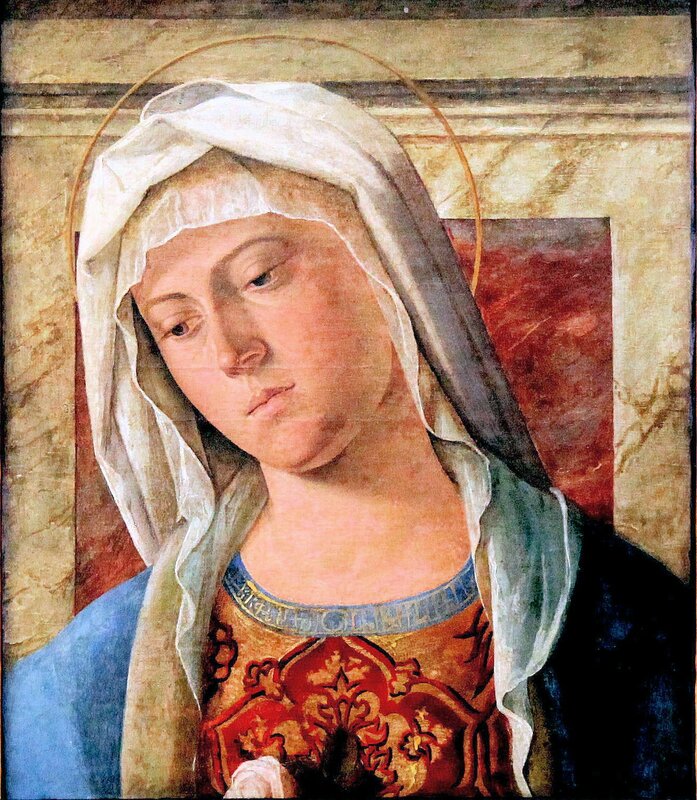 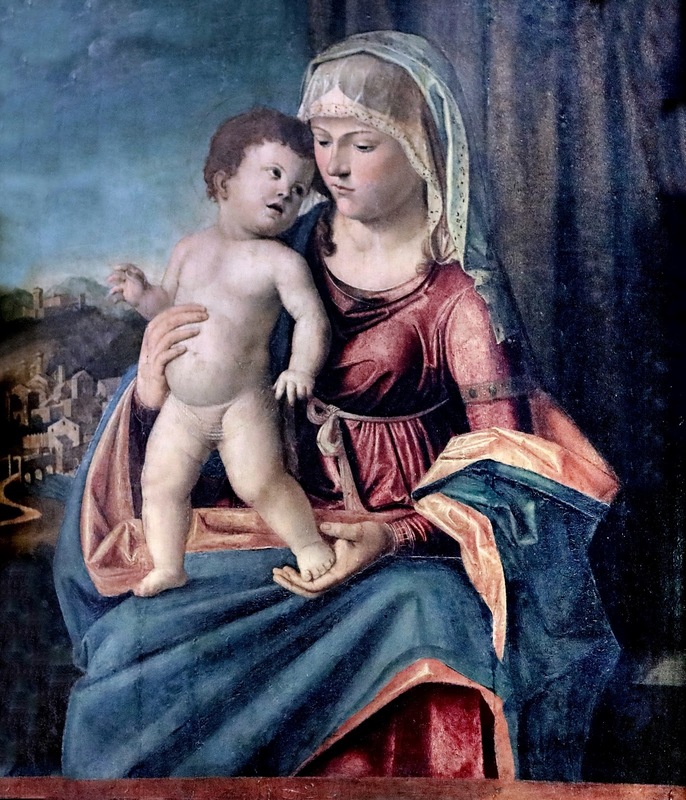 This picture is done in distemper and savours so much of the style of Bartolomeo Montagna, who lived at Vicenza from 1480, as to make it highly probable that Cima was his pupil. 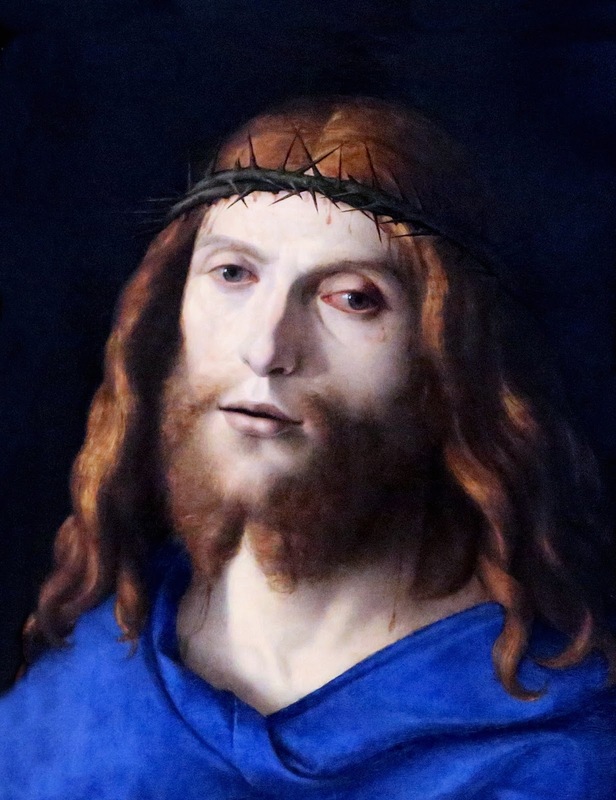 Even in this early production Cima gave evidence of the serious calm, and almost passionless spirit that so eminently characterized him. 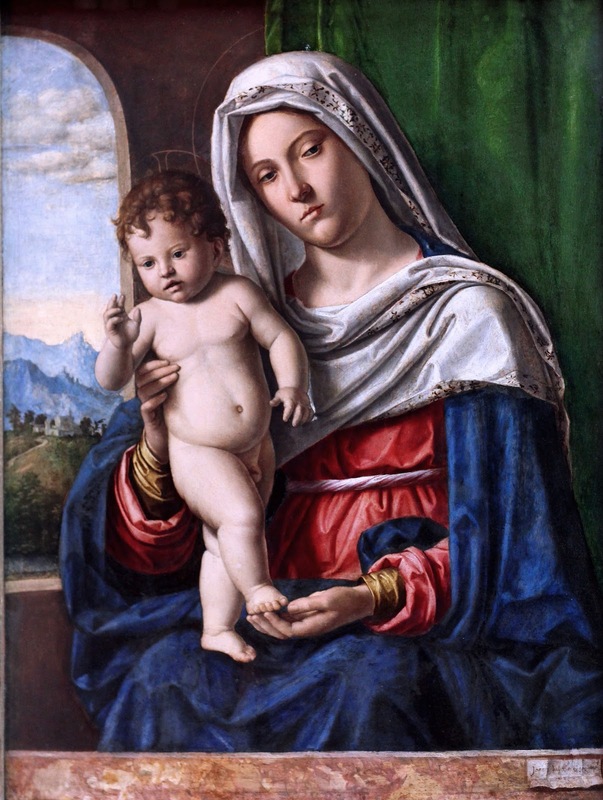 Later he fell under the influence of Giovanni Bellini** and became one of his ablest successors, forming a happy, if not indispensable link between this master and Titian**. 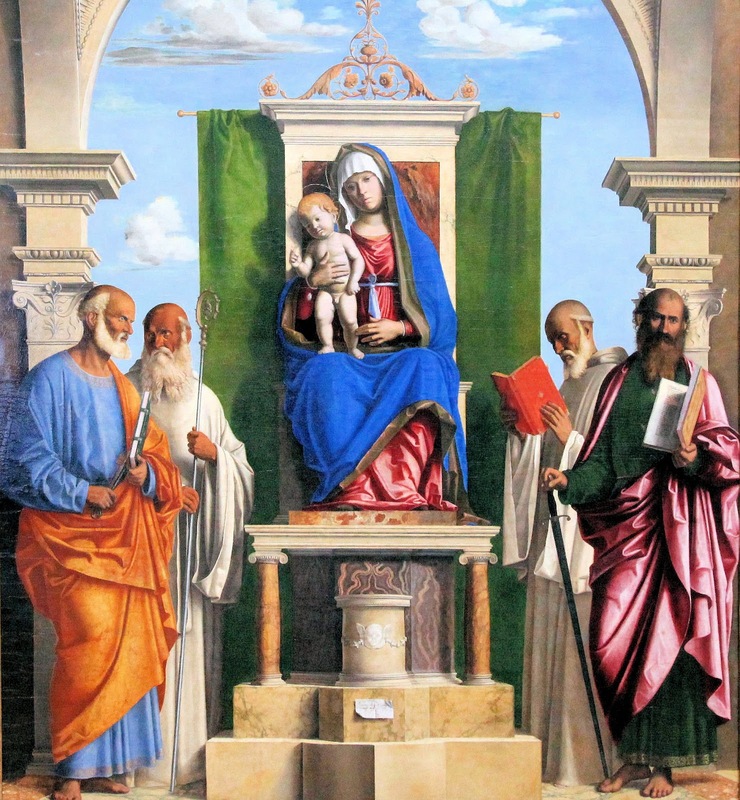 At first his figures were somewhat crude, but they gradually lost their harshness and gained in grace while still preserving the dignity. 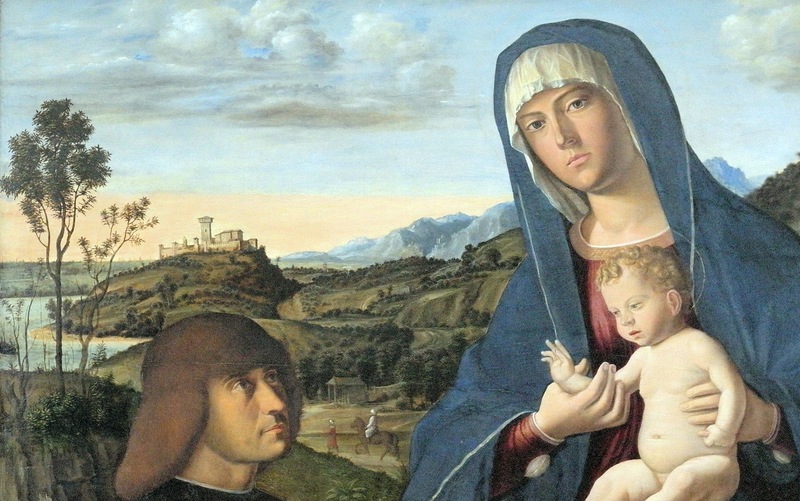 In the background of his facile, harmonious compositions the mountains of his country are invested with new importance. 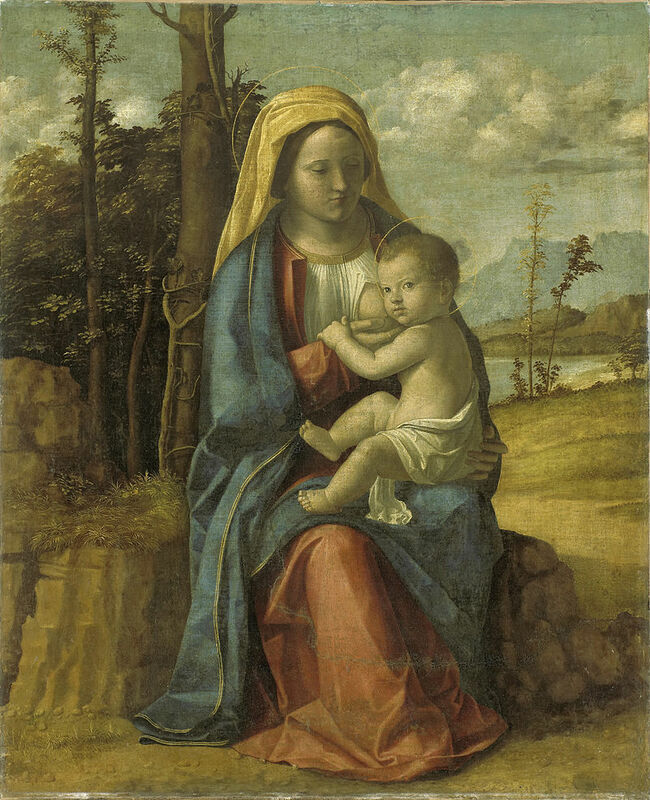 Cima was one of the first Italians to assign a place for landscape depiction, and to formulate the laws of atmosphere and of the distribution of light and shade. 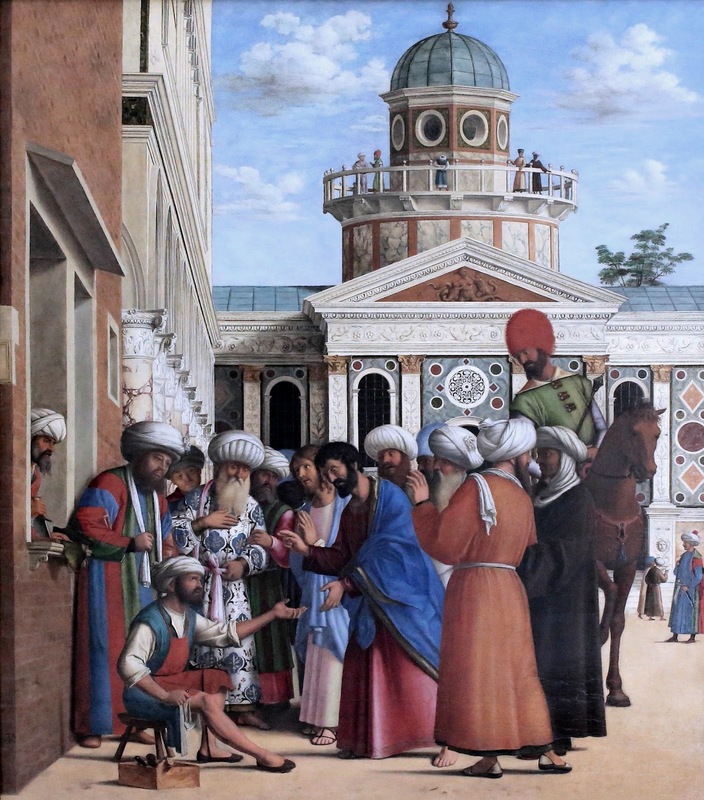 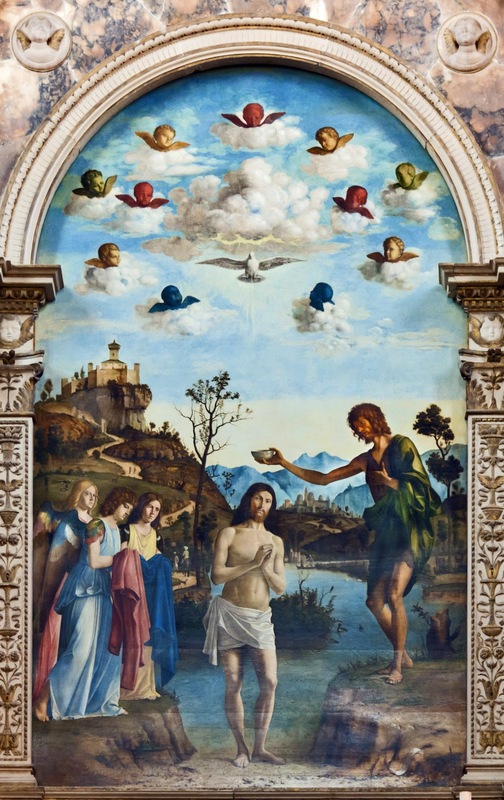 His Baptism of Christ in the church of San Giovanni in Bragora, in Venice (1492), gives striking evidence of this. 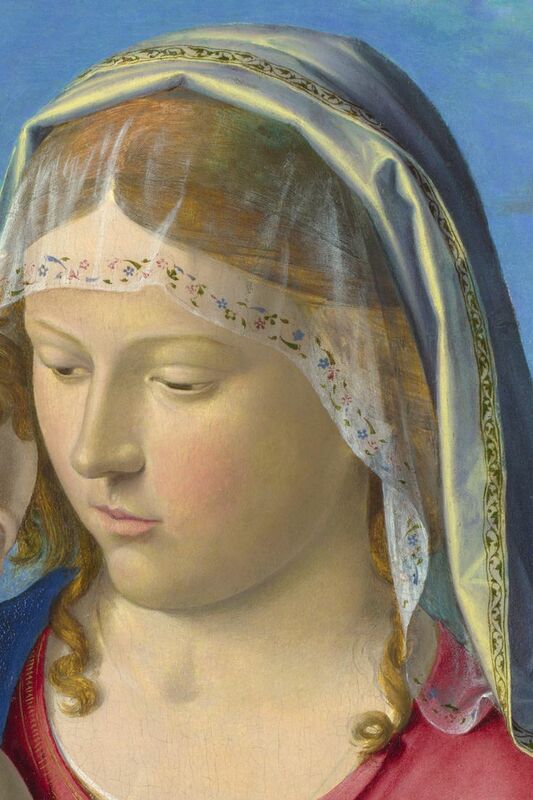 The colouring is rich and right with a certain silvery tone peculiar to Cima, but which in his later works merges into a delicate gold. 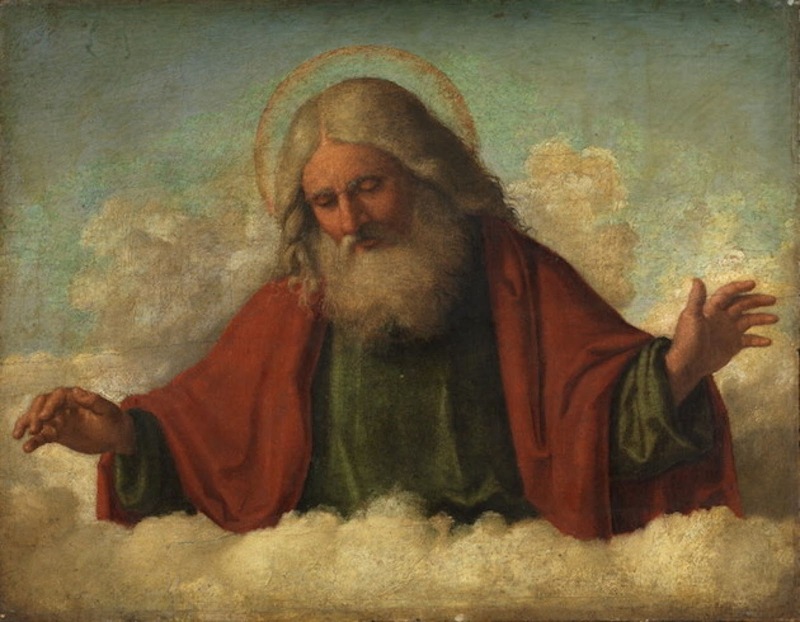 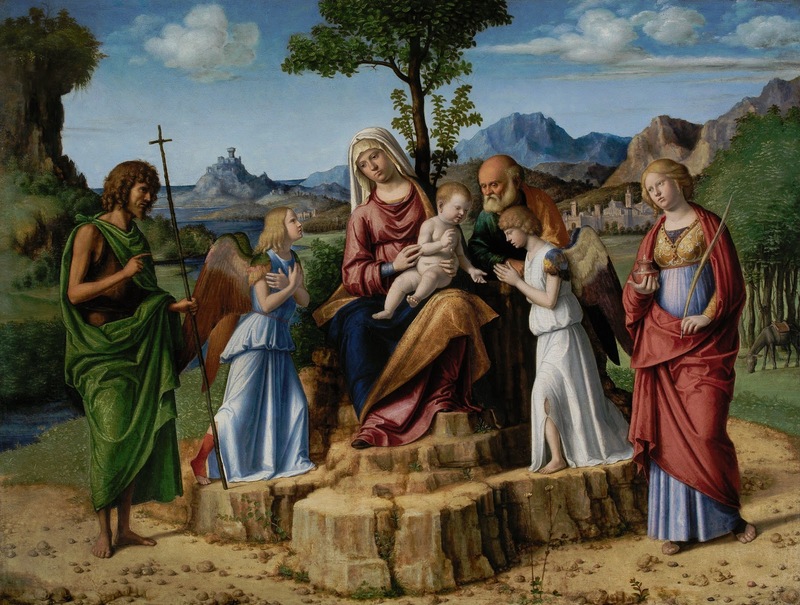 His conceptions are usually calm and undramatic, and he has painted scarcely any scenes (having depicted religious ones almost exclusively) that are not suggestive of "sante conversazioni". 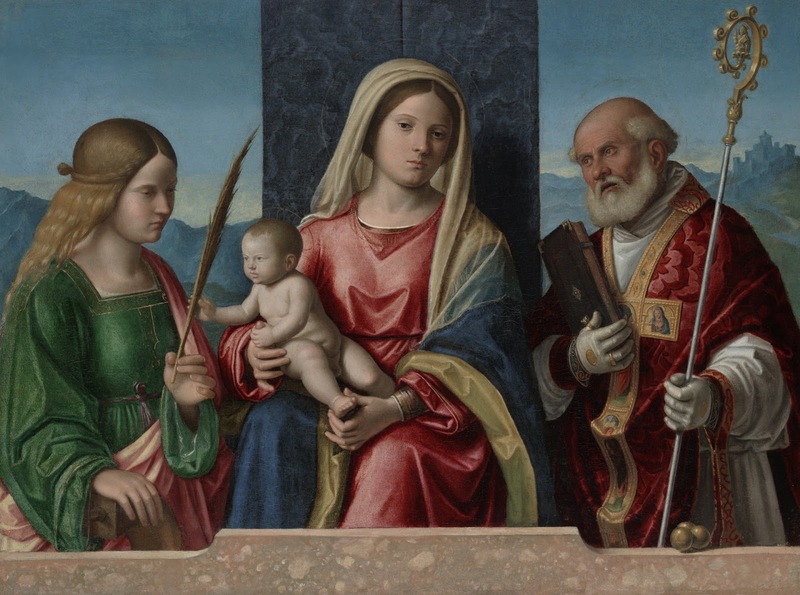 His Incredulity of St. Thomas (National Gallery, London) and his beautiful Nativity (Venice, Santa Maria dei Carmini, 1509) are hardly aught else. 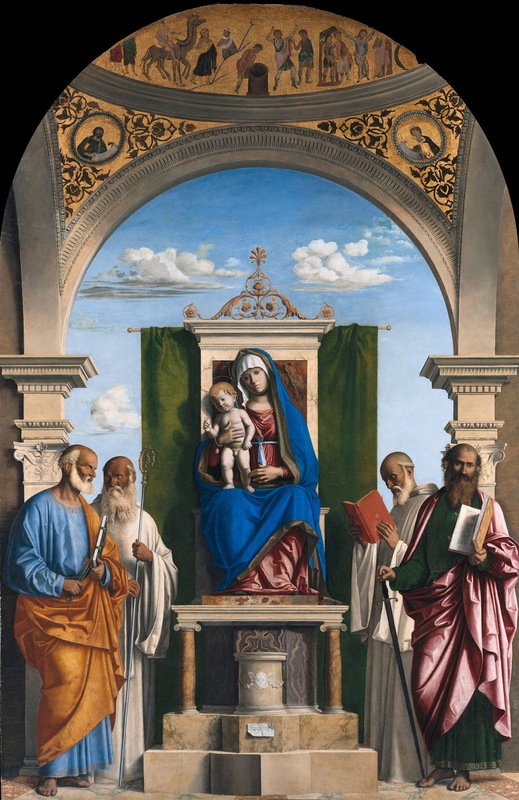 But most of his paintings represent Madonnas enthroned among the elect, and in these subjects he observes a gently animated symmetry. 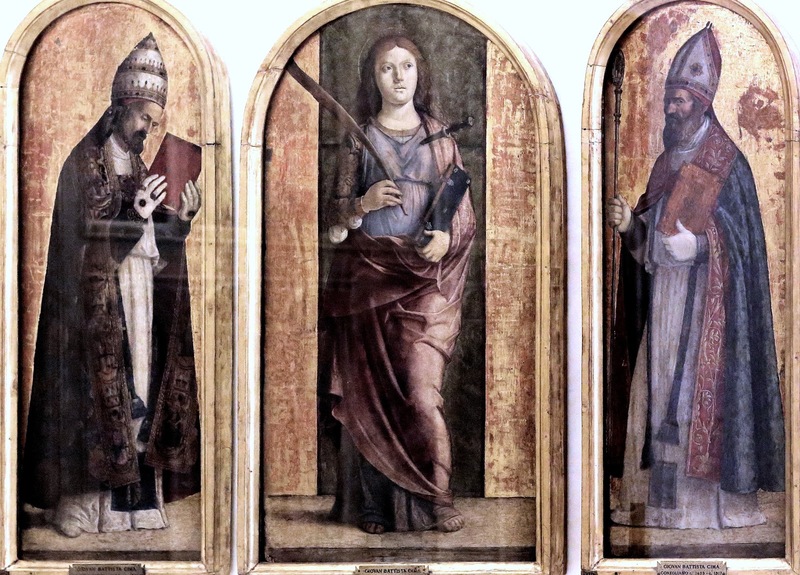 The groupings of these sainted figures, even though they may not have a definitely pious character, and the impression of unspeakable peace. 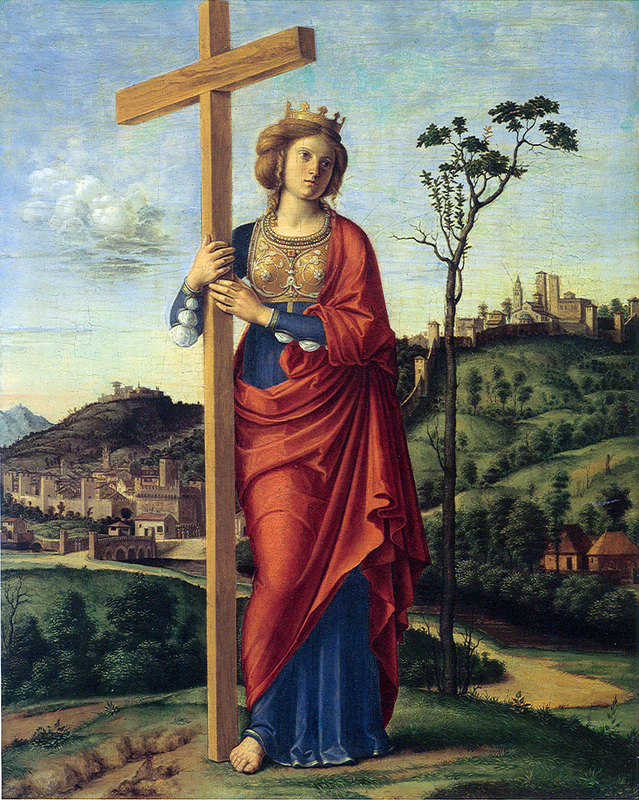 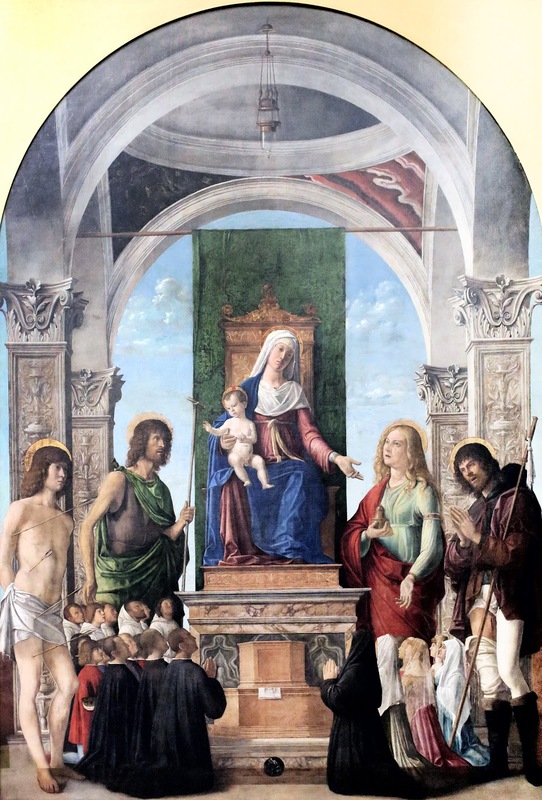 Cima da Conegliano, soprannome di Giovanni Battista Cima (Conegliano, 1459/1460 - Conegliano, 1517/1518), è stato un pittore Italiano**, esponente della scuola veneta del XV secolo. 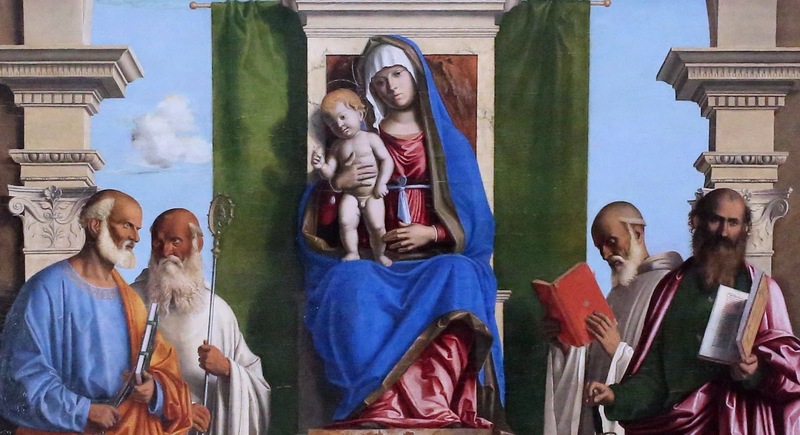 Tra il 1500-1515 visse probabilmente tra Venezia e l'Emilia. 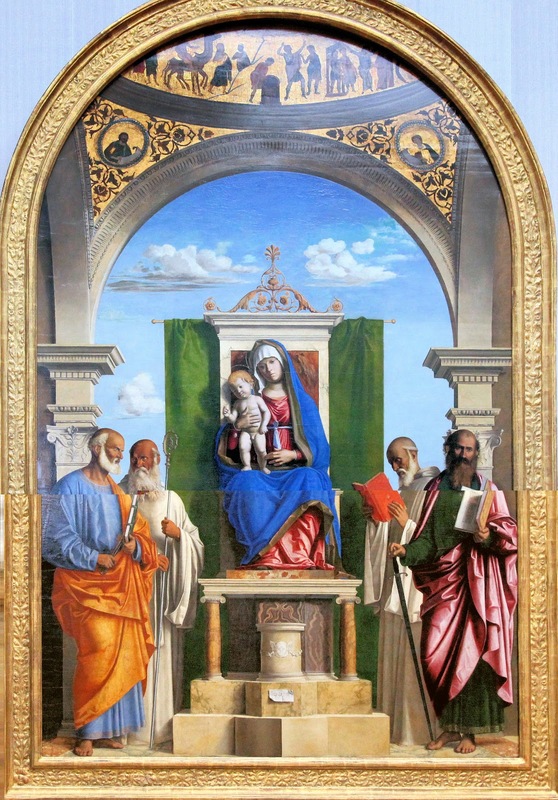 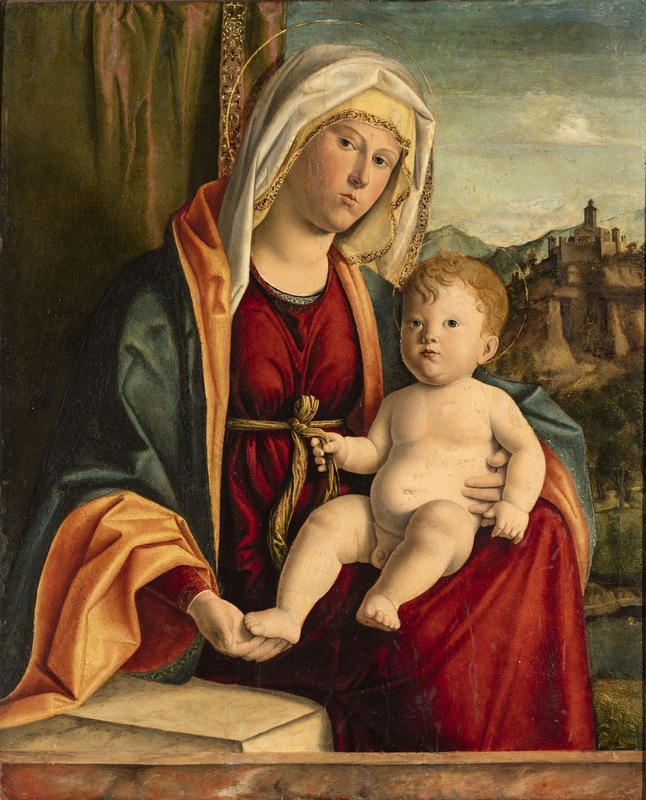 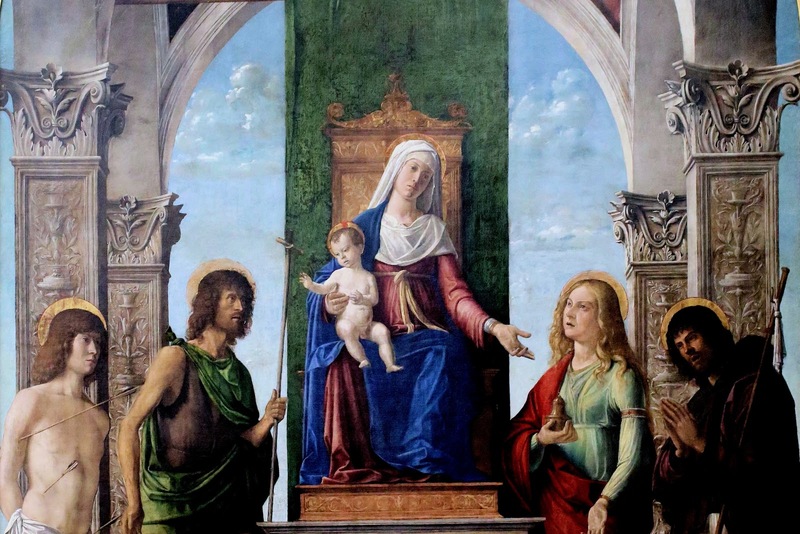 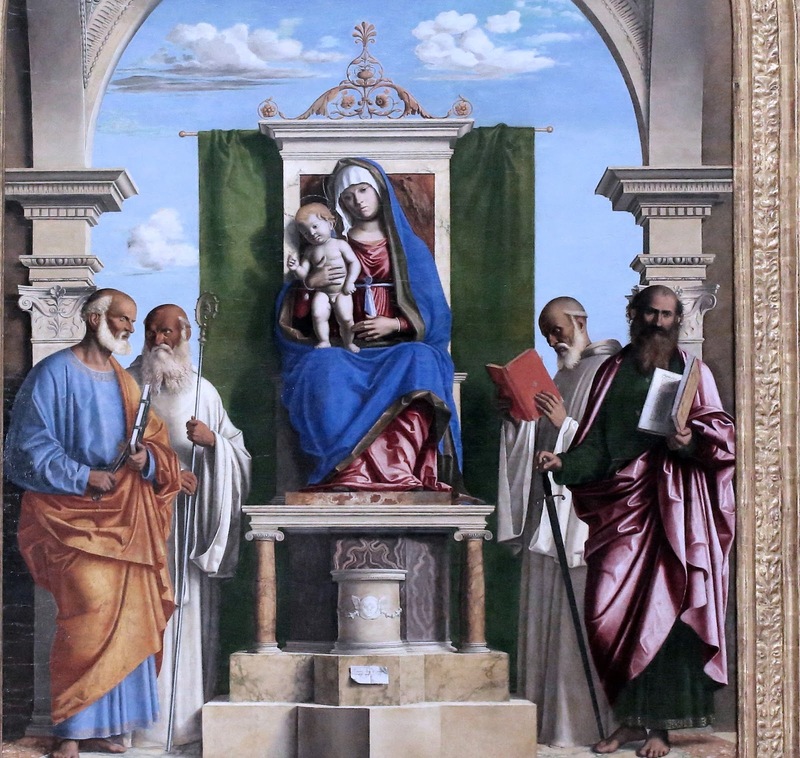 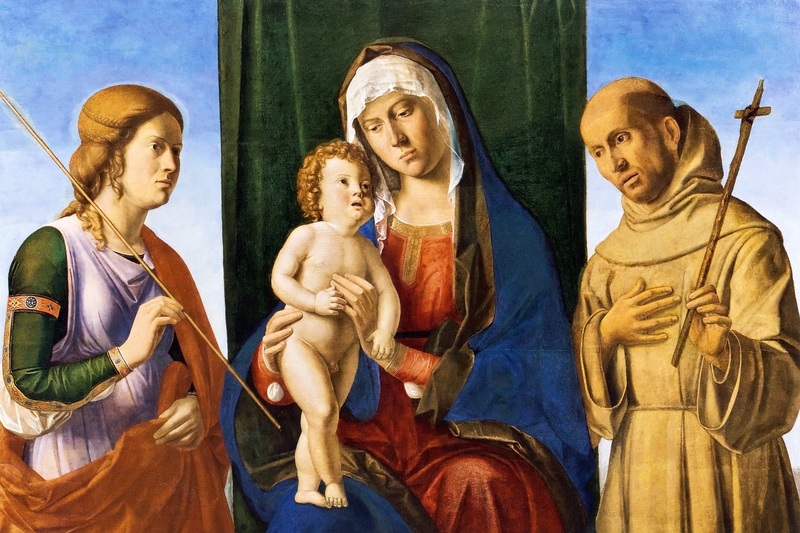 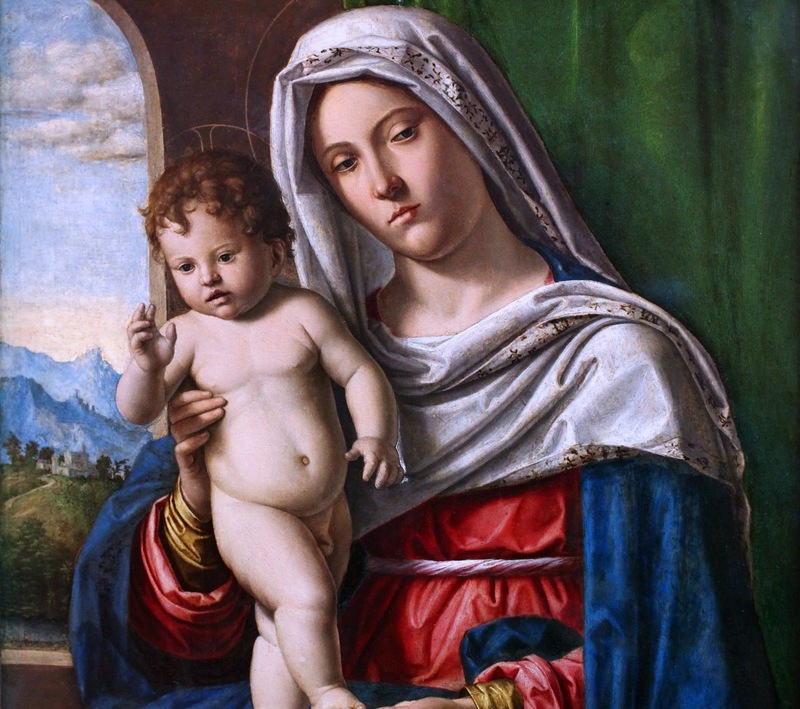 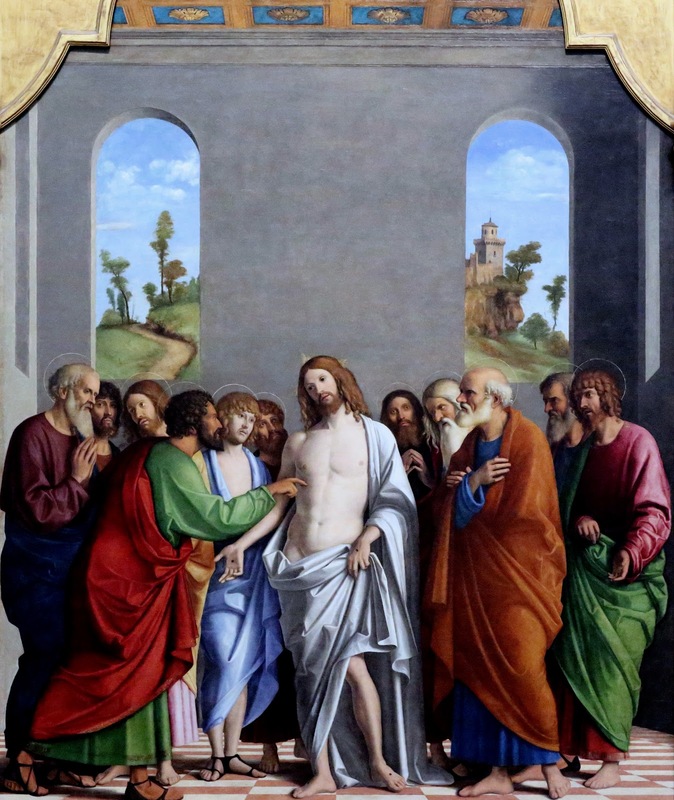 A Parma, Bologna, Carpi gli vennero commissionate opere per alcune chiese, quali la Madonna col Bambino tra i santi Michele Arcangelo e Andrea del 1505 e la Sacra Conversazione del 1513. 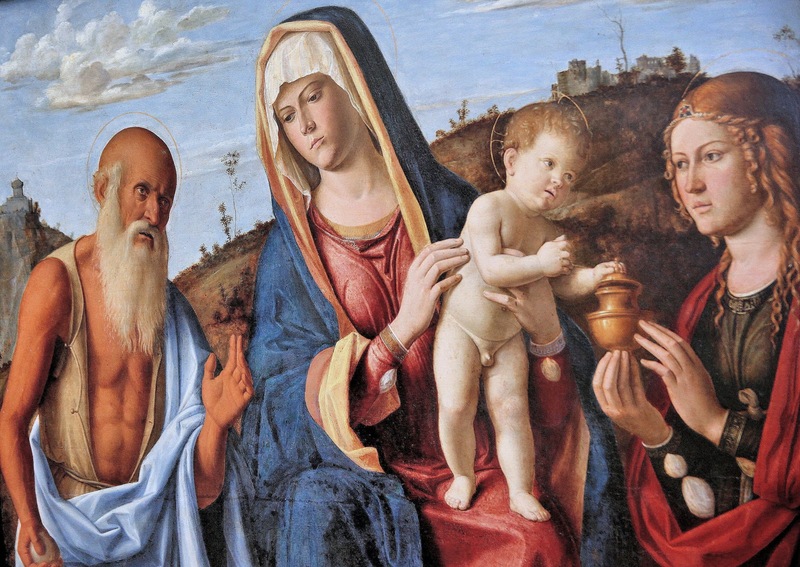 La sua presenza a Conegliano, dove trascorreva le estati, è documentata, per l'ultima volta, nel 1516. 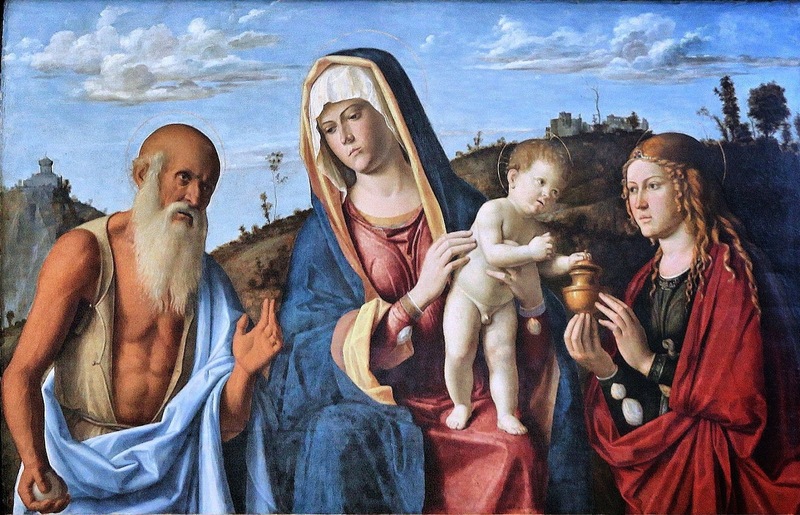 Morì fra il 1517-1518, probabilmente a Conegliano, dove resta la sua dimora, oggi Casa museo di Giovanni Battista Cima. 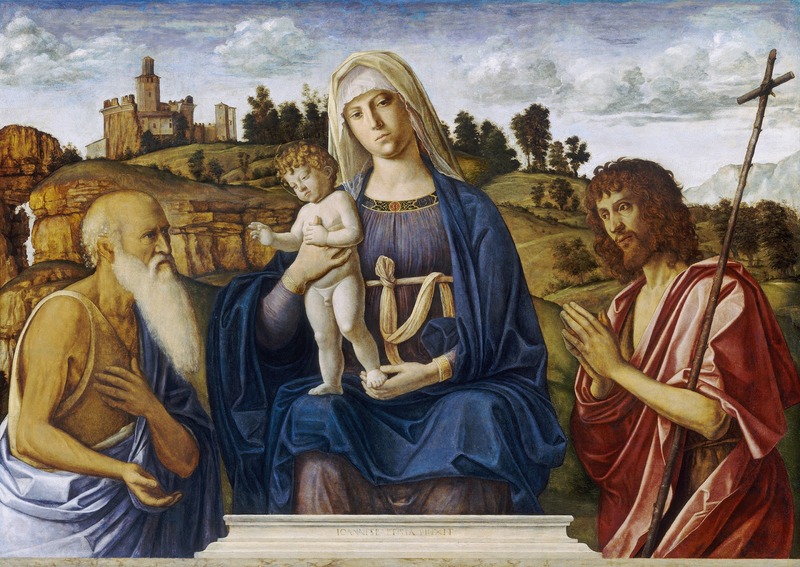 Tra i maggiori esportatori della cultura artistica veneziana nel retroterra veneto della Serenissima, con il suo stile pittorico improntato ad un raffinato classicismo, Cima viene generalmente ritenuto, dagli storici d'arte, un allievo di Giovanni Bellini**. 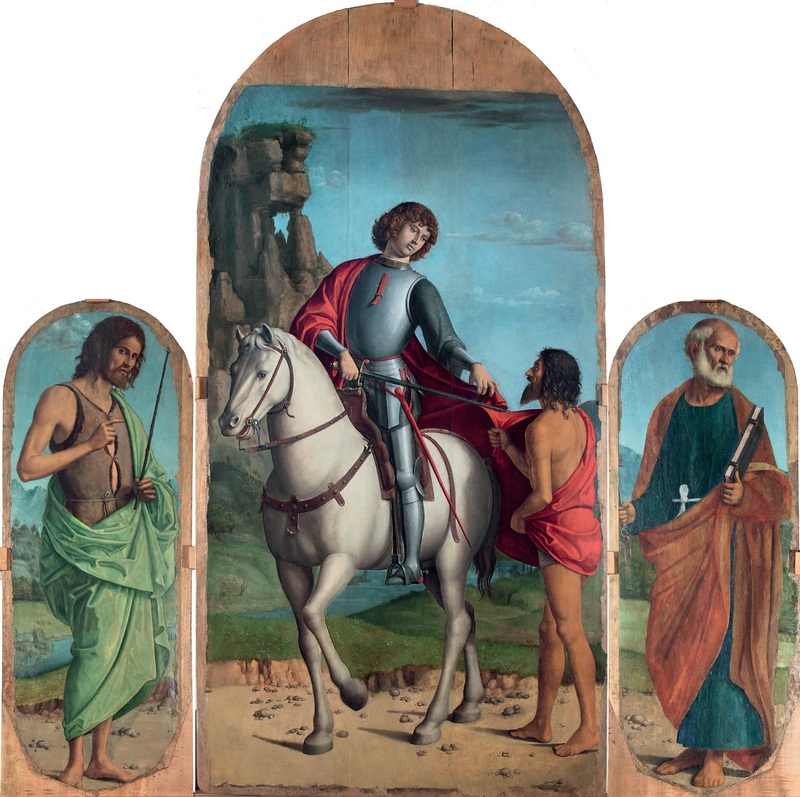 Altre influenze pittoriche riconoscibili sono quelle di Antonio Vivarini, Vittore Carpaccio, Giorgione**, Marco Palmezzano. 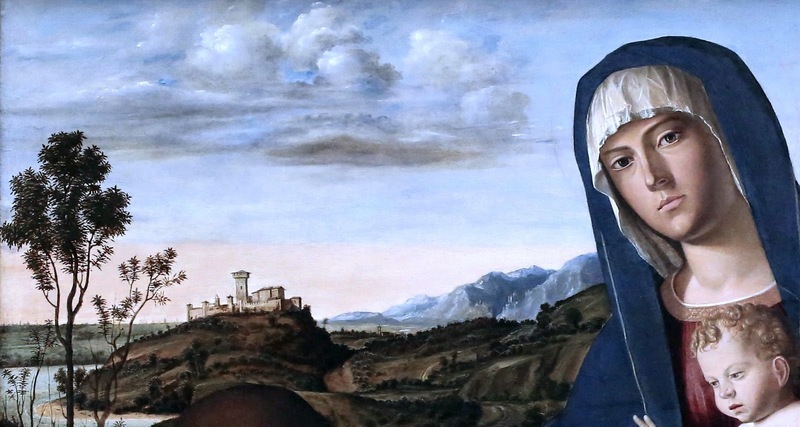 Le Sacre Conversazioni ed altre composizioni di Madonna con i santi. 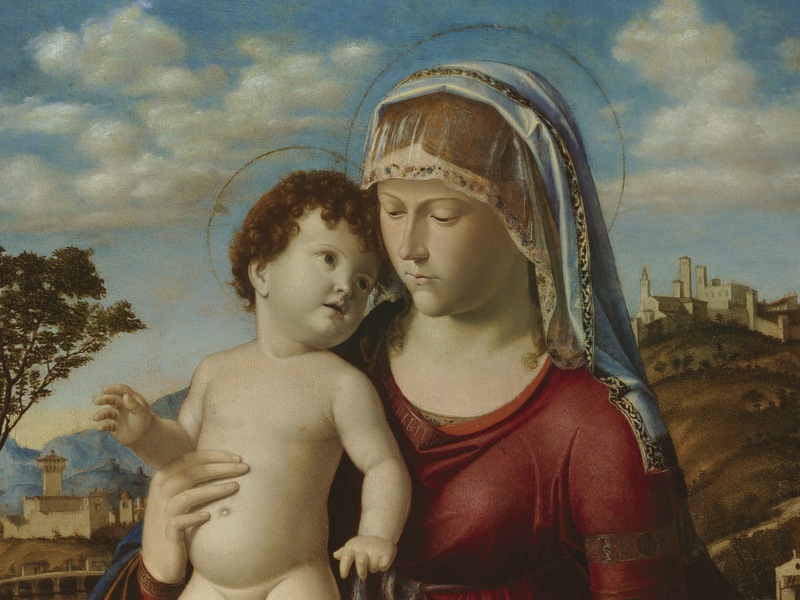 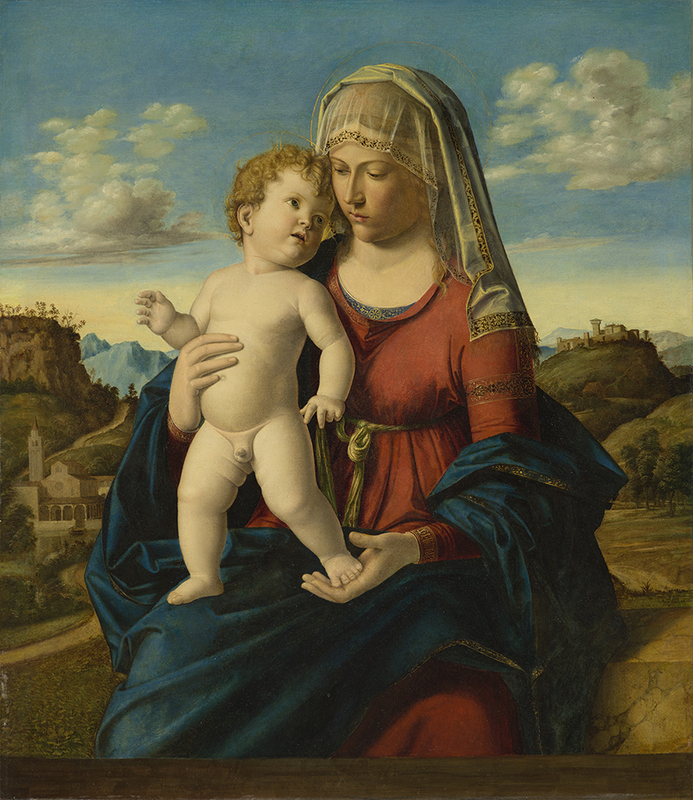 Fra le opere più significative di questo tipo, la Sacra Conversazione del 1495 conservata alla National Gallery of Art di Washington, considerata la migliore fra quelle del pittore, e la Madonna col Bambino tra i santi Michele Arcangelo e Andrea del 1505 conservata alla Galleria Nazionale di Parma ed erroneamente attribuita, nel XVIII secolo, a Leonardo da Vinci** per la falsa firma sul dipinto.